After meeting with the Gerson family this morning, we would like to provide an authorized and accurate update of where things stand. Last night the turnout for the search orchestrated by Shomrim and family friends had numbers beyond belief. There were long waits and even longer lines and we appreciate the incredible patience that everyone had. Yes, there were some leads that we are all hearing about but so far none of them have panned out reliably. We understand that as Shabbos arrives options will be limited so we are launching one final effort today. Thousands of flyers are being printed as we speak. 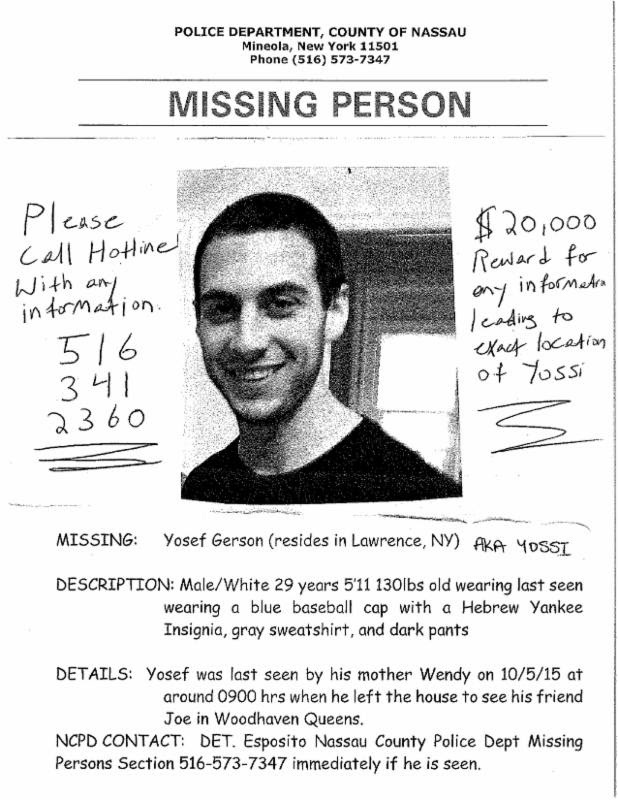 We are going to literally blanket several areas where Yossi was potentially seen with these flyers. These include areas in the Five Towns, Queens and Brooklyn/Crown Heights. Our hope is that with thousands upon thousands of flyers with Yossi's face plastered around New York City, one person somewhere will ultimately help bring Yossi home safely. In addition, our NYPD liaison, Alex Wercberger, has arranged for every police precinct and police car in the Queens area, where Yossi was supposedly seen, to carry these flyers. IF YOU ARE ABLE TO HELP WITH THIS EFFORT, PLEASE COME TO 334 CENTRAL AVENUE IN LAWRENCE BETWEEN 12:30-1:30PM TODAY. AGAIN, THE SPECIFIC MISSION WILL BE TO POST FLYERS IN AS MANY PLACES AS POSSIBLE. WE WILL NOT NEED HUNDREDS OF PEOPLE FOR THIS EFFORT SO IF YOU ARE UNSURE IF YOU NEED TO ATTEND, YOU CAN EMAIL US AND YOU WILL RECEIVE A PROMPT RESPONSE. Finally, we know that there have been inquiries about an Atzeres Tefillah for Yossi. It is our fervent tefillah that as Shabbos approaches, Yossi will be found safely. If this is c"v not the case, then we will IYH announce the location and timing of such an event over the weekend. Once again we would like to thank our incredible community for literally bonding together like never before.